This day, I begin with a poem I wrote after the Gulf War. I couldn’t go. I couldn’t watch. Across the river, mourners gathered. his bleeding eyes onto me. As a child, I celebrated Memorial Day in my hometown of Portland, Maine by attending a parade. My dad, the owner of Levinsky’s Army & Navy store, awakened me early to make certain my sister and I stood close-up, at the curb, to watch the Navy and Marine Bands, the Deering and Portland High School bands, the veterans of WWI and WWII march by. The event was always thrilling— Dad, at my side, saluting to the marchers—strangers to me but known in some mysterious way, by my dad. He was a sales person, a man who spent his lifetime outfitting active servicemen and veterans. He spoke rarely of war, of the stories he heard and read in The Portland Press Herald during WWII. I intuited—deep in my gut—his essential regard and respect for those men and women who served. With my own children, I continued the ritual of attending Memorial Day parades. The first sound of the drum core, the high stepping high schools twirlers, was exciting. Always, the most moving marchers were the war veterans —some, in faded uniforms, others in suits, flags in lapels, walking tall and proud, conveying their privilege to serve. 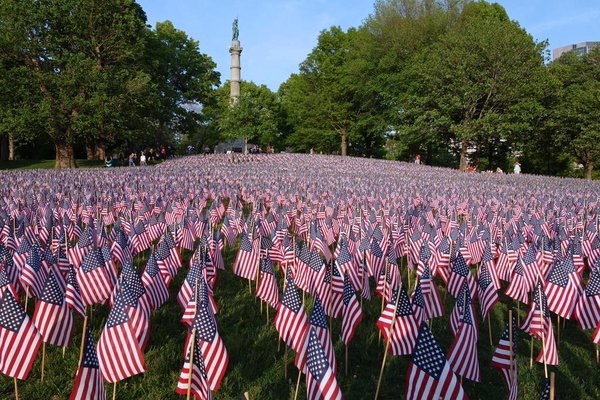 This Memorial Day, I write about the profound annual event of the 37,000 flags planted at the Soldiers and Veterans Monument on the Boston Common. Just five days before this Memorial Day, 500 volunteers, organized by the Massachusetts Military Heroes Fund, planted row after row of American flags. Each hole dug, each flag planted, honored a fallen veteran, man or woman. Families of service members who died on active duty since 9/11/2011, read the names of loved ones in front of the flag display. A chorus of voices bore witness and called the multitude of hero’s names to the heavens. I am grateful to the Massachusetts Military Heroes Fund and the 500 volunteers for their gift of remembrance. They say a picture is worth a thousand words. The picture of the Military Heroes Garden is worth 37,000 namesakes and all the more— for to remember is to hold the promise of ending all wars. This entry was posted in Currents, Mindfulness, Relationship(s), Sustainability, Uncategorized, Writing and tagged flags, Massachusetts Military Heroes Fund, Memorial Day, Parades, veterans on May 30, 2016 by fayewriter. Faye, your poem is beautiful. Thank you for sharing the flag picture at Boston Commons. It is quite moving. Let there be peace on Earth! Thank you, Heather, sister blog writer! Yes, a day to remember and to honor all of those who serve and protect our freedoms! We saw Monument Men awhile back. It was very memorable and worth seeing again. I quite agree. Btw Zoe a sensitive, caring granddaughter.